This story was updated at 6 p.m. ET. HOUSTON – NASA's shuttle Discovery linked up with the International Space Station today (Feb. 26) to make one last delivery before hanging up its wings for good. Discovery and its six-astronaut crew docked with the space station at 2:14 p.m. EST (1914 GMT) as both spacecraft flew 220 miles (354 kilometers) above western Australia. Their arrival marked the end of a two-day orbital chase that began with the shuttle's last launch on Thursday. "What took you guys so long?" the space station's commander Scott Kelly joked with Discovery's crew as the shuttle drew near. NASA initially tried to launch Discovery in November, but fuel tank cracks held the mission up until repairs were completed. When the shuttle finally lifted off it was still nail-biting; with pad crews repairing a last-minute ding and NASA working through a computer glitch just before liftoff. Discovery is flying an 11-day mission to deliver a new storage room and a humanoid robot assistant called Robonaut 2, along with supplies and spare parts, to the International Space Station. Two spacewalks are also planned during the mission. Space shuttle Discovery approaches the International Space Station for docking on Feb. 26, 2011 during its final mission, STS-133. Discovery is NASA's oldest and most-flown space shuttle. It will be retired later this year along with the rest of the U.S. shuttle fleet. The arrival of Discovery's crew doubled the number of people living on the station from six to 12. The joint crew includes astronauts from the United States, Italy and Russian cosmonauts. The two space crews will spend the next seven days working together to move cargo between their two vehicles. Discovery's arrival also marked a historic space first: For the first time since construction began on the International Space Station in 1998, spacecraft from four of the five major partners (the space agencies of Russia, Japan, Europe and the United States ) are docked at the orbiting laboratory. The remaining partner, Canada's space agency, does not have station-visiting spacecraft, but it did build the outpost's robotic arm and Dextre maintenance robot. Altogether, the docked spacecraft and space station weigh 1.2 million pounds. NASA and its partners hope to stage a space photo session by cosmonauts flying around the station in a Soyuz spacecraft if time allows during Discovery's flight. Before Discovery hooked up with the station, Lindsey flew the shuttle to a point about 600 feet below the orbiting laboratory and deftly guided the 100-ton spaceship through a slow back flip. As Discovery turned, astronauts inside the orbiting lab took hundreds of high-resolution photos of the shuttle. The images will be beamed back to Mission Control on the ground so that teams can assess how the shuttle's heat shield fared during liftoff, ascent and the two days in orbit. During launch, a camera on Discovery's fuel tank spotted four pieces of foam debris, some of which appeared to strike the orbiter during its ascent, but NASA officials said the impact should pose no problems for the spacecraft or its crew. A review of the photos taken of Discovery's heat shield today will help them make a final call, NASA officials said. Discovery is no stranger to the orbital flip maneuver. In 2005, Discovery became the first space shuttle ever to perform the maneuver during the STS-114 mission — NASA's first flight after the loss of shuttle Columbia and its crew in 2003 due to heat shield damage. The space flip and photo session have been a standard part of shuttle missions ever since. After the pre-docking flip, Lindsey pulled Discovery in front of the station and slowly backed the shuttle into its docking port. 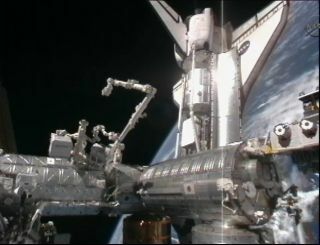 The docking occurred two minutes ahead of schedule, but Discovery's crew was forced to wait about 40 minutes before driving in the bolted latches due to a slight gravitational misalignment between the shuttle and station docking mechanisms. Once the two spacecraft were firmly latched, station and shuttle crews began a series of leak checks. The hatches between Discovery and the International Space Station were opened at 4:16 p.m. EST (2116 GMT) and Discovery's six astronauts floated into the station one by one. Discovery launched Thursday (Feb. 24) from the Kennedy Space Center in Florida. It is scheduled to return to Earth March 7 and then be shipped to a museum for public display.